Elmer Andrew Shedd, 92, of Wyandotte, Michigan formerly of Haleyville, entered into rest on Feb. 26, 2019 at Henry Ford Hospital in Detroit, Michigan. Mr. Shedd was born on Aug. 29, 1926, in Phil Campbell, Alabama. Elmer served in the United States Navy during World War II. He worked as an electrician at Great Lakes Steel and retired as a superintendent of the 80 Inch Mill in Ecorse, Michigan. Elmer loved fishing and having a large garden every year. Visitation will be held on Sunday, March 3, 2019 from 6-8 p.m. at Nichols Funeral Home in Haleyville, where services will be held on Monday, March 4, 2019 at 11 a.m. Brother Gary Wakefield will officiate. Burial will follow in Ashbank Freewill Baptist Church Cemetery in Nauvoo, Alabama. 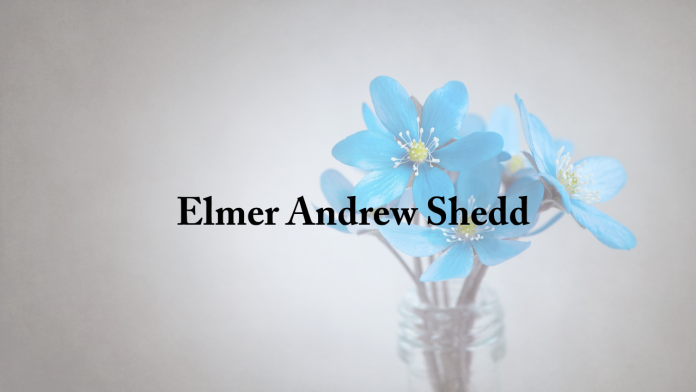 Elmer is survived by his loving wife of 74 years, Minnie Roberta Shedd; daughter, Sarah Shedd; brother, Cardine Shedd; and a host of nieces and nephews. He was “Poppow” to 2 grandchildren, Teresa Hipshire, Lisa Ulsh and “Grandpa” to 1 great grandson, William Peek III. He was preceded in death by his son, Ralph Shedd; and parents, Phillip and Nora Shedd.